We had waited a long time to start work on the living room floor. Part of the delay had been our dilema as to what material to use. Whilst we were delighted with the adobe floors in the bedrooms, their fragility meant that care had to be taken with furniture, as well as choice of shoes. We didn't want our guests to have to be asked to remove heavy outdoor shoes or high heels, nor be worried about chairs scraping on the floor. So we plumped for a concrete floor - hardwearing, heat-retaining as long as we used a dark colour and beautiful if finished correctly. To avoid the risk of cracking on such a large area we used the column as a central pivot with rays of concrete leading away to the edge of the living room. Each section was marked out using steel bars then filled with cement that had been coloured with black powder dye from Germany. The 'wedge' was then trowelled out by hand to produce a smooth finish. Each section took a day to complete. We had carved out a curved step to bridge the hallway with the living room and decided to continue the concrete floor to the entrance to the bathroom. We then had to put the floor on hold while we built the concrete counter tops for the kitchen in the living room. Geronimo prepares the bases for the forms for pouring the concrete counter tops. Reinforcing steel is wired together and a thin strip of plywood curved to the correct shape. The large space in the centre of the counter top is to house the large double butlers sink. Geronimo wets down the wooden form while the black concrete is being mixed. Marco shovels the mix onto the form while Jeronimo and Honorato spread it out. When the mix is roughly in place, grooves are marked out for the draining board and a slope is formed to drain into the sink area. Now the hard work really begins, endless hours of trowelling the mix smooth. Finally it's trowels down and a 10 day wait until the concrete has cured sufficiently to polish. Water must be sprayed on regularly to prevent cracks caused by fast drying. And a makeshift shade has to be hung against the windows to stop the glare of the high altitude sun. In Bolivia there are four types of furniture - expensive imported modern, classic dark Spanish style, melamine flat pack and crude wooden. Antiques are rare and ridiculously expensive, second-hand furniture just doesn't exist. How we long for ebay, flea markets and even Ikea (something I thought I would never say!) But it was a chance for us to be creative, to create furniture to complete the Roundhouse and its garden. So it was down to Ed, with a little help from me, to make furniture. He needed a workshop, which would also double as a sculpture studio for him and some space for me to do ceramic work etc. We chose the location at the very back of the property, behind the Roundhouse. A small studio with bathroom to accommodate us when we rented out our rooms was included in the plan, as well as a laundry room and storeroom for food and furniture. 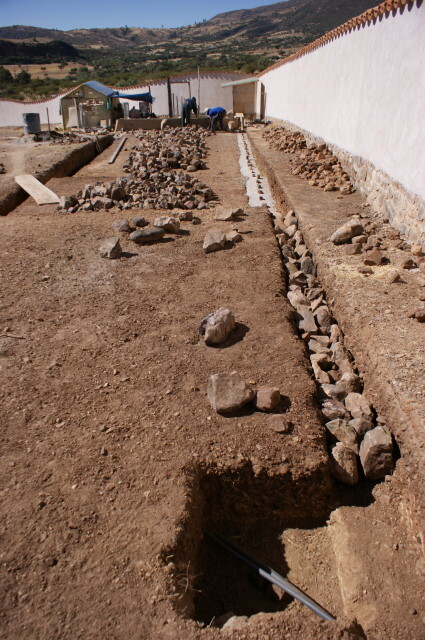 Foundations were dug and laid with stones and cement. This was going to be a basic build considering that all the rooms would be utility. We used eucalyptus posts for the window lintels, previously employed for scaffolding in the living area. 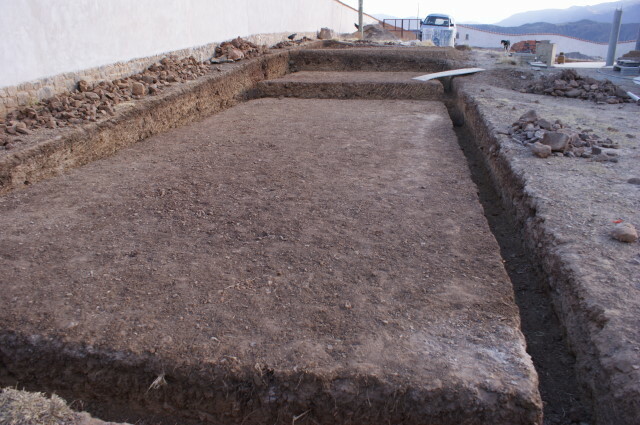 Then continued with the earth bricks to the roof level. We used more eucalyptus posts for the main roof beams. Standard factory-made windows were installed. Cross beams were placed across the roof. Then river reeds - the nearest we could get to bamboo - were hoisted onto the roof. David and Carmelo began the long process of nailing the reeds to the beams. The reed work was finished, then corrigated steel was bolted onto the roof. Finally the adobe walls were rendered with lime.